CyberCoinBank’s G$ is taking an early lead over the OMC multi-grid currency from Virwox. Although G$ is only accepted on 8 grids, compared to 14 grids for OMC, there is over 63 million G$ (US $210,000) in circulation, compared to just 302,037 OMC (US $1,045). There are several reasons for this. One is that the G$ has been around since 2008, and trades in Second Life as well as on OpenSim grids. Another is the CyberCoinBank also offers loans, which increases the amount of currency in circulation. In addition, the currency is currently being used for a virtual casino, said CyberCoinBank head Frank Corsi. Finally, Corsi’s and his team are aggressively pursuing both third-party distributors and merchants to accept the currency, including offering free land for stores on the startup Alpha Towne grid to merchants. Disclaimer: Alpha Towne is an advertiser of Hypergrid Business (see sidebar to your right) but we’ve been more than happy to bash the G$ currency in favor of OMC in the past — mostly because OMC has been so forthcoming with statistics over the past few months, publishing transaction data in extreme detail, broken down by both by date and by grid. Before yesterday, the only way we could compare the two currencies was by the number of grids, where OMC was clearly in the lead. In addition, Virwox bills OMC as a fully convertible currency, and the company runs an online exchange in which the OMC can be converted back to US dollars or Euros. The G$, by comparison, is advertised as a “fictional currency” and CyberCoinBank does not guarantee convertibility, though users may be able to find third-party currency holders who are willing to trade it. Then CyberCoinBank released its first set of numbers this week, and they blow OMC away. Corsi still refused to divulge the location of that virtual casino, however. “What do we in transactions for one month is more than OMC has done its lifetime,” Corsi told Hypergrid Business. Overall, the G$ does approximately six times more business each month than the OMC. 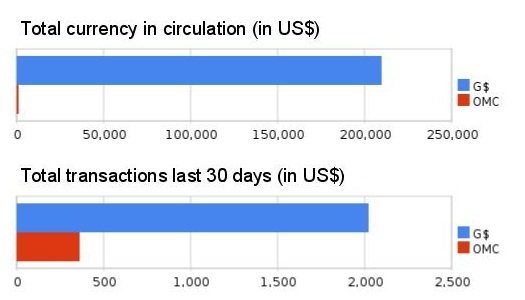 For example, over the past 30 days, G$ has seen 607,045 G$ (US $2,023) in total transactions, while the OMC reports 104,756 OMC (US $362) in transactions. There is also a Web-based marketplace for G$ vendors that links back to in-world shopping location. For example, the Alpha Towne marketplace is here. Accepting G$ payments is simpler than accepting OMC payments. For the latter, the entire grid must be approved by Virwox, while merchants can sign up independently for G$. 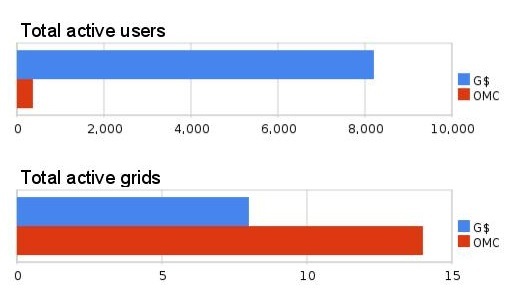 A module will become available in September for grids using Corsi’s hosting services. Modules allow for greater integration between a currency and the viewer — for example, allowing the user’s balance to show up in the top right corner of the viewer. In addition, Corsi said, CyberCoinBank will step in and help mediate disputes between merchants and customers, a service that Second Life doesn’t offer. The company makes money by renting server space and selling the G$ currency through its partners. Partners can buy G$ at 500-to-1 and sell it at a retail rate of 300-to-1. Corsi said he takes a hands-off attitude to what his customers do with the servers they rent from him or the G$ they use. This particular grid, Meta 7, uses the G$ currency and a marketplace, but runs its own servers, Corsi added. The casino is also only using the G$ currency, and uses off-shore hosting for its servers, he said. Corsi’s flexible attitude about the ways in which the G$ currency is used is something he has in common with Frank Kappe, a professor at the Institute for Information Systems and Computer Media at Austria’s Graz University of Technology, and one of the creators of the OMC. 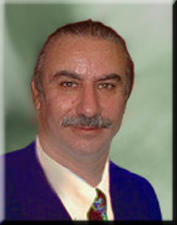 Frank Corsi was one of the pioneers of the first dot-com boom, running bulletin boards, credit card processing for websites, and co-location facilities. 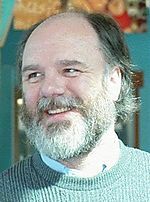 His company Internet Advisor Corp. went public in 1998, he told Hypergrid Business. He finally retired from running a data center in 2004. His retirement didn’t last long, however. He saw Anshe Chung on CNBC talking about making money in Second Life, and jumped in. His projects in Second Life included the Linden Bank, later renamed to The Bank, a venture capital company, and a land rental business. Corsi still had a whole room of servers at his house and loaded up OpenSim as soon as he came home from the convention. According to Corsi, the financial problems with his Second Life bank happened after he left. Troubles followed him to OpenSim. 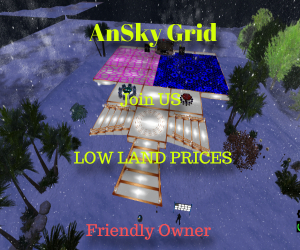 He sold off his first grid, Central Grid, after about a year to focus on building a shopping and currency system for OpenSim. The grid was renamed to Legend City, prices were doubled — and the grid folded soon after, but not without leaving bitter feelings on all sides. Corsi then moved on to Avatar Hangout, but a dispute with his partners caused him to part ways with that grid. “Frank has always been an innovative user of virtual worlds, pushing the limits of what people can do,” said Aldon Hynes, a long-time virtual worlds journalist and former business editor of the Second Life News Network. Sometimes this results in disputes, Hynes said, but that can happen anywhere in an rapidly evolving industry such as virtual worlds. 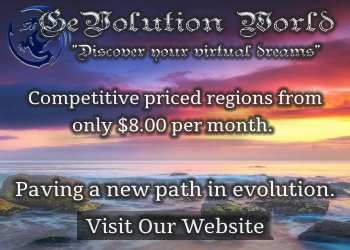 Today, Corsi is not only involved in the G$ currency system, and the Alpha Towne grid, but also a growing number of other virtual worlds projects. Corsi’s company is Global Virtual Holdings, Inc., headquartered in Indiana. It directly owns CyberCoinBank, Virtual World Search, Avatar Marketplace, and the VWBIZX stock exchange. Global Virtual Holdings owns 40 percent of Virtual Highway, Inc., which operates the Virtual Highway grid, and the PrimHosting OpenSim hosting company. Global Virtual Holdings is an equal partner — with virtual worlds developer Chris Greenwell — in Virtual Development Center, Inc. Virtual Development Center owns 27 percent of the United Nations Citizens grid — the rest is owned by California-based ad agency Heads & Tails, Cisco, Equifax, and venture capital firm Capital Window. Global Virtual Holdings owns a third of Virtual World City, Inc., which runs the Alpha Towne grid. Finally, Global Virtual Holdings owns 50 percent of Virtual World IP Association, a content and land registration service for virtual worlds. The other partners are a traditional title company and a professor of law. “This is still under development,” Corsi said, adding that it will most compliment the services offered by Virtual World City. Next story Are Women Better at Virtual Events Than Men?